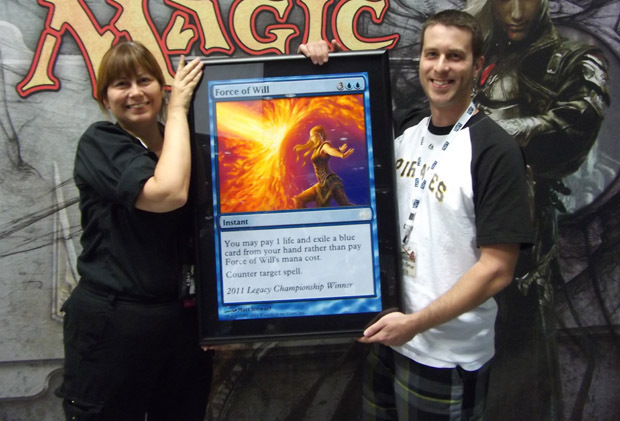 Welcome to Eternal Central’s coverage of GenCon 2011! Scroll down below for Vintage and Legacy results as they stream in. We will be updating this periodically throughout the weekend as news, results, and tidbits flow in from the Internet and our friends on site, so keep hitting the F5 to refresh all weekend and keep it locked to EC for your Eternal news! NOTE: If you have news or results or details you can provide, PLEASE hit us with and email to eternal.central@gmail.com or hit us up on Twitter (@EternalCentral)! Swiss rounds based on attendance, cut to single elimination Top 8. Winner receives a 2-round bye at the 2011 Vintage Championship! Additional prizes to Top 8. Vintage Format. Incredible Prizes based on the Vinage Format – including the Vintage Trophy, a one of a kind Time Walk Painting. Swiss rounds based on attendance plus single-elimination Top 8. ‘Vintage’ Boosters for other top finishers. Mark Hornung (Dredge) defeats Paul Mastriano (Bob Gush) 2-1 in an epic final game, and is your 2011 Vintage Champs winner! In round 5 Menendian (@SMenendian on Twitter) just bested MeanDeck teammate and friend Paul Mastriano in the 73 card mirror match. 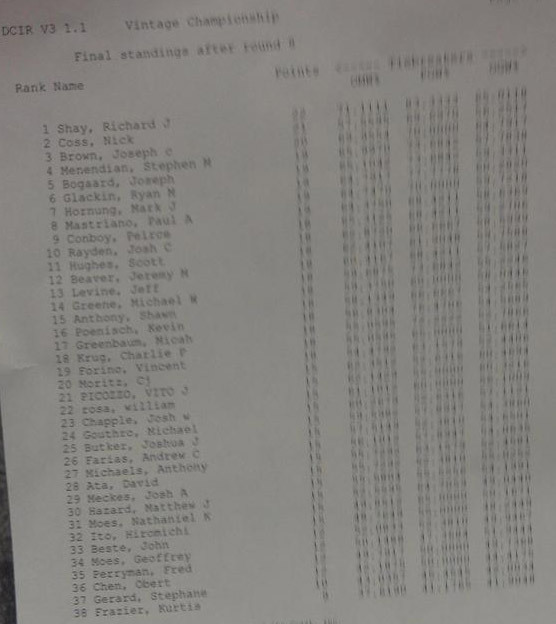 Steve then lost Nick Coss (allegedly piloting Minus 6) in round 6, and has just beat Josh Chapple (playing UBW Wizards) in round 7, and then drew with Mark Hornung into the Top 8 next round. Notable East Coaster Ryan Glackin (@KingSquee on Twitter) has been on a nice hot streak in 2011, and has started off 5-0, beating UR Jace Control RD1, another Jace deck RD2, Painter RD3, Mono Red Workshop w/Magus RD4, and GW aggro RD5. Glackin was paired against Joe Brown (also 5-0) in round 6 and they intentionally drew, putting them both at 5-0-1. Ryan just lost to Rich Shay in round 7, and needs to win his next round to secure a Top 8 slot after his ID in round 5 with friend Joe Brown. Rich Shay has come to play this weekend. After going 9-0 in Vintage Prelim 1 on Thursday he is currently standing at 7-0 after beating Ryan Glackin, and he has locked up a Top 8 birth. From the Vault, From the Vault – play Vintage and win From The Vaults! Vintage format, Swiss Rounds with a cut to Top 8. Winner takes home one From The Vault Dragons, From the Vault Relics and From the Vault Exiled! Additional booster prizes for Top 8. Vintage Format. 64 Players maximum. Swiss Rounds by attendance with a cut to Top 4 single elimination playoff. Foil Set of M12 to winner, additional prizes based on record. Swiss rounds based on attendance plus single-elimination Top 8. Winner receives a 2-round bye at the 2011 Legacy Championship. Additional prizes to Top 8. 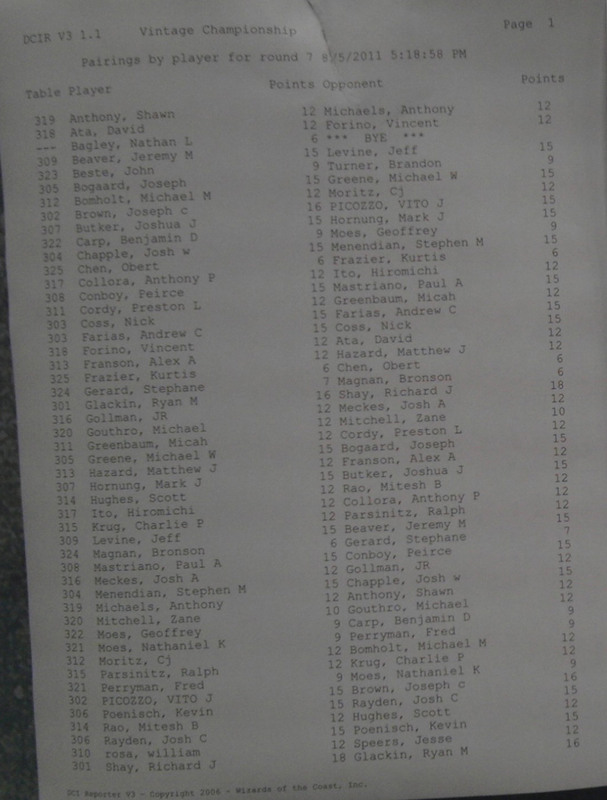 Legacy Format. Incredible Prizes based on the Legacy Format – including the Legacy Championship Trophy, a one of a kind Force of Will Painting. Swiss rounds based on attendance plus single-elimination Top 8. Second Place receives one set of Revised Edition Dual Lands (10 lands, 1 of each). ‘Vintage’ Boosters for other top finishers. 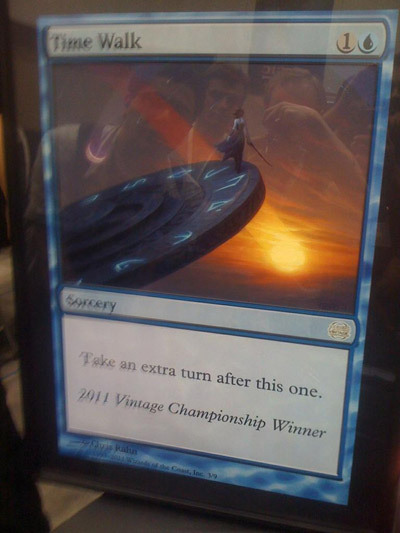 Jared Kohler (Merfolk) defeats Reed Hartman (NO RUG) 2-1, and is your 2011 Legacy Champs winner! From the Vault, From the Vault – Play Legacy and win From The Vaults! 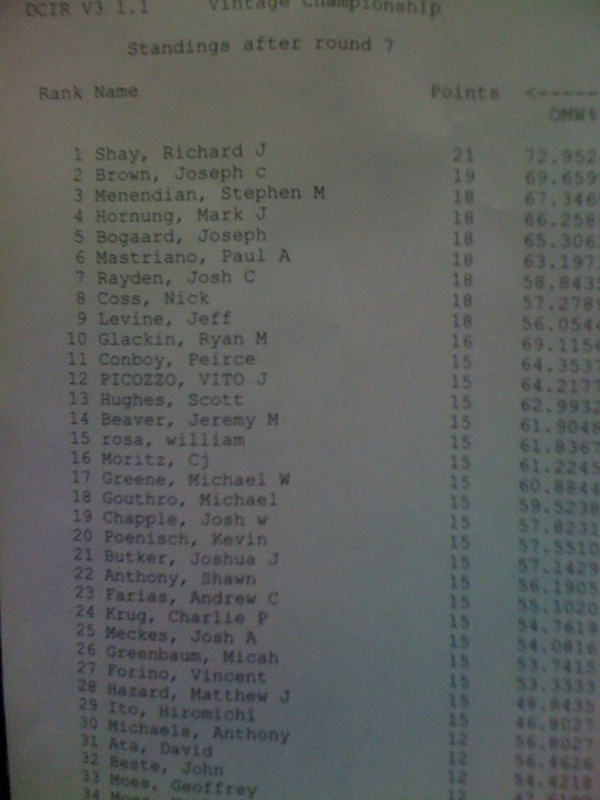 Legacy format, Swiss Rounds with a cut to Top 4. Winner takes home one From The Vault Dragons, From the Vault Relics and From the Vault Exiled! Additional booster prizes for Top 8. Maximum 64 players.